Discussion in 'Range Reports' started by Djcala, Oct 31, 2018. Shot first 100 thru new pistol today. Its a simple build as parts went on sale over 10 months gun. 10.5 inch 1\7 5.56. Initial plan was simple fsb n carry handle iron sights. But my lone eye is tired today so i mounted a old 4x scope for a lil help. Smart move as i simply could not see target properly beyond 50 yds. I did the testing prone off my mat and backpack in the yard just wasnt interested in much more today. 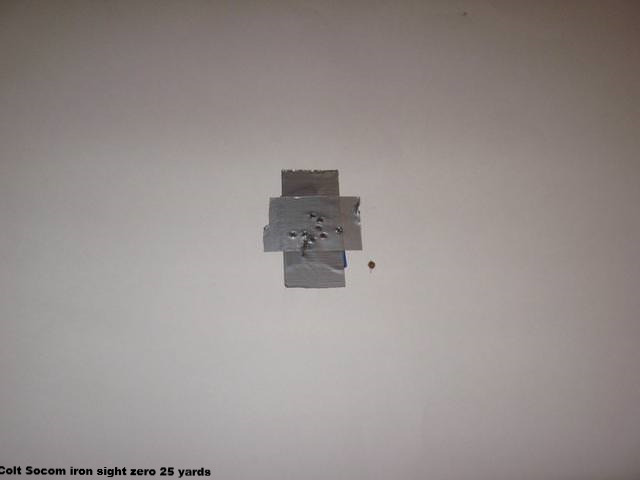 I shot and cleaned for about 25 rounds at 25 yards. Functions fine maybe a tad "slappy" perfect ejected pile at about 1:30. May experiment with buffer wts/spring later maybe not. oli700, meanstreak, nitesite and 2 others like this. Should serve you and yours for as long as you need it to. It's pretty accurate with non-match ammunition. Colt Replica scope, right? It's amazing that you could get it to shoot 1" low at 25-yards. It was probably near the end of its turret travel! Yes basic colt replica, id used it before on a 20" i was pretty suprised it was near on already only dropped 12 clicks down, windage was fine. I actually bumped it back up couple clicks when i did actual zero check at 50. I dont forsee any match grade this is purely a fun shooter and conversation piece. Way to loud and bright for a house gun for my taste, and if im outdoors in harms way il take the extra velocity/accuracy from a 16 to 20 inch. Now for a slung gun offering more firepower than a traditional pistol but smaller and lighter than a full size rifle, its an intersting option i carried it yesterday walk around property che cking trail cams was out of way yet handy with better range and power than most any sidearm. Basically just fun, but capable of serious social work in a pinch ?? Sweet gun and nice shooting. Not to hijack the topic, but since it's been a few days, I just wanted to reply back. I was able to sight in the colt upper that a got a while back. I'm a bit embarrassed that it's took me this long to be able to take a shoot it any as it has, but I didn't have to touch the detachable carryhandle or the front post at 25 yards. No kidding, they were dead on where they needed to be. I pulled the first shot (that's typical for me since I'm always leary the first time that I shoot something) but it was like the combination was made for each other. I saw no need to shoot at the duct tape any more than I did. I went through a few rounds rapid fire at the steel and heated the barrel up some, but everything was tight and just as it should've been. I love it when stuff works the way it's supposed to right out of the box. After I shot a few times, I looked at the gun and looked at the target, and in my best Doug Marcaida voice, I said: "It will shoot". meanstreak, nitesite and John A. like this. Dang John, you wasted duct tape. You only needed half as much as you used. Good shootin. John A. and Djcala like this. Heads up !!! AR pistol enthusiasts, my son was here this evening we did some night work. AAR by 3 individuals a soldier a marine and a cop: ar pistol home defense GET A CAN !!!! Unless you want blown eardrums and nightblindness while attempting to fight in your home ya better have a CAN or a diff weapon. ^ Pretty much mirrors what I told you. Has a lot of bark and flash. I think those are the exact words that I used. You want a good gun to grab at night? suppressed blackout with 194 gr Lehigh max expansion bullets loaded with 8.5 or 8.6 gr of #9 powder. That keeps the velocity up as high as possible while not busting eardrums. I simply do not know of a better tool for the job. You need one of those shoulder things that goes up and you put on the other end of the gun. I do indoor training fairly regular basis, many suited for the task and not obnoxious buggers at all.